The table on the right gives brief details of the purposes of the six new packet types. This data packet token has been added as part of a system for controlling multiple isochronous IN packets during one microframe at high speed. For each isochronous IN packet requested, the suffix of the DATAx PID represents the remaining number of packets to be transferred during the current micro-frame. This data packet token has been added as part of a system for controlling multiple isochronous OUT packets during one microframe at high speed. All but the last packet sent during a microframe use the MDATA PID. The last packet sent uses DATA0, DATA1 or DATA2 depending on whether one, two or three packets were sent. NYET handshake packets are used in 2 different high speed situations. One use is when a hub wishes to respond to a 'complete split' transaction to say that it is has not yet been completed. The other use is during the high speed control or bulk OUT PING protocol. It means that the endpoint has accepted the data but is not yet ready for further data. Used during the high speed split protocol by a hub, to indicate that there was an error on the full or low speed bus. This packet introduces a Start Split transaction or a Complete Split transaction. Split transactions are used at high speed to communicate to a hub, the details of a low or full speed transaction which it is expected to handle, and to get back the results. A PING packet is used on high speed Control and Bulk OUT endpoints. They may be sent by the host to establish whether the endpoint is ready to accept a DATA0 or DATA1 packet, and will result in an ACK or a NAK packet from the device. This is an efficiency improvement, as at full or low speed, the data packet has to be sent in full, and only then can the endpoint respond with a NAK. For the sake of completeness we will now look at the packet formats for all the available packets type, including the ones already covered for low and full speed. There are five different packet formats based on which PID the packet starts with. Used for SETUP, OUT, IN and PING packets. They are always the first packet in a transaction, identifying the targeted endpoint, and the purpose of the transaction. This device address can address up to 127 devices. Address 0 is reserved for a device which has not yet had its address set. There can be up to 16 possible endpoints in a device in each direction. The direction is implicit in the PID. OUT, SETUP and PING PIDs will refer to the OUT endpoint, and an IN PID will refer to the IN endpoint. Used for DATA0, DATA1, DATA2 and MDATA packets. If a transaction has a data stage this is the packet format used. DATA0 and DATA1 PIDs are used in Low and Full speed links as part of an error-checking system. When used, all data packets on a particular endpoint use an alternating DATA0 / DATA1 so that the endpoint knows if a received packet is the one it is expecting. If it is not it will still acknowledge (ACK) the packet as it is correctly received, but will then discard the data, assuming that it has been re-sent because the host missed seeing the ACK the first time it sent the data packet. DATA2 (along with DATA1 and DATA0) is used in High Speed links as part of a system for controlling multiple isochronous IN packets during one microframe at high speed. 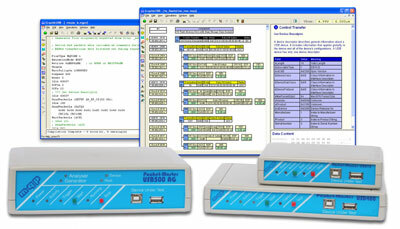 MDATA (along with DATA2, DATA1 and DATA0) is used in High Speed links as part of a system for controlling multiple isochronous OUT packets during one microframe at high speed. Used for ACK, NAK, STALL and NYET packets. This is the packet format used in the status stage of a transaction, when required. Receiver acknowledges receiving error free packet. Receiving device cannot accept data or transmitting device cannot send data. Endpoint is halted, or control pipe request is not supported. No response yet from receiver (high speed only). The Start of Frame packet is sent every 1 ms on full speed links. The frame is used as a time frame in which to schedule the data transfers which are required. For example, an isochronous endpoint will be assigned one transfer per frame. On a low speed link, to preserve bandwidth, a Keep Alive signal is sent every millisecond, instead of a Start of Frame packet. In fact Keep Alives may be sent by a hub on a low speed link whenever the hub sees a full speed token packet. At high speed the 1 ms frame is divided into 8 microframes of 125 us. A SOF is sent at the start of each of these 8 microframes, each having the same frame number, which then increments every 1 ms frame. The SPLIT packet is the first packet in either a Start Split transaction or a Complete Split transaction, sent to a high speed hub when it is handling a low or full speed device. The maximum packet size can only be specifed as 512 bytes. A more efficient method of doing OUT transfers has been introduced, involving the use of PING transactions, and the new NYET handshake packet. Before sending an OUT transaction to a bulk endpoint, the host controller may send a PING packet. The response to the PING will be ACK or NAK. ACK means that the endpoint is ready to accept an OUT transaction of maximum packet size for the endpoint. NAK means it is not. The host may continue to send PINGs after a NAK, or it may choose to wait for a number of microframes before re-trying. On high speed Bulk OUT endpoints, the endpoint descriptor value bInterval is required to specify the NAK rate of the endpoint. The specification is misleading when it defines this value. The value represents the number of microframes which the host would have to wait, after receiving a NAK in response to a PING, before a further PING is guaranteed to elicit an ACK response. 0 means the endpoint never NAKs. A further new feature is that, after a successful OUT transaction, the endpoint may respond with ACK to indicate that it is already prepared to accept a further packet, or NYET to indicate that it received the data correctly, but is not yet ready to accept further data. As isochronous transactions do not include a acknowledgement (handshake) packet, a system was specified which allows the recipient to be aware, if a data packet is lost, which one it was*. When requesting IN transactions, the device packages them in DATA2, DATA1 or DATA0 packets, depending on how many packets per microframe are specified, and which one it is. See diagram on the right. *In fact this does not apply to Isochronous OUT transfers with three transactions per microframe because the first two packets use MDATA as a PID. The protocol is the same as for full and low speed, in that DATA0 and DATA1 packets are alternated. If more than one transaction per frame is specified and a transaction is NAKed, then the host should attempt no more transactions on that endpoint within the same microframe. For high speed control endpoints, the maximum packet size for the data stage is fixed at 64 bytes. During a data phase, using an OUT PID, the transaction follows the rules above for a Bulk OUT transaction, including the PING protocol. Notice that it is not permitted for a device to respond to a SETUP with a NAK, STALL or NYET. Split transactions form a high speed only protocol between host controllers and high speed hubs, which are handling full or low speed traffic. This is the means by which the full or low speed traffic is prevented from degrading the high speed bus performance. Each high speed hub is required to have a 'Transaction Translator' which handles the full or low speed transactions to particular ports. To overcome the difference in speeds, each full or low speed transaction is split into two parts on the high speed bus; a Start Split Transaction and a Complete Split Transaction. In between, the Transaction Translator independently handles the full or low speed transaction. The illustration to the right shows how the host defines the required full or low speed transaction, allows the hub to deal with the transaction at that speed and then checks back later for the result. The actual packet sequence in a split transaction varies, depending on the type of transaction involved, and will be described in more detail, in the following paragraphs. This will be a brief summary of what to expect, however the full USB specification contains masses of detail which would be needed to actually implement a host controller or hub. This is a much simplified diagram of the transaction translator within a high speed hub. This illustrates a typical split transaction sequence; in this case a split interrupt IN. For a split bulk OUT transaction, the host sends a Start Split packet specifying the hub address and port number, and speed (full), with the 'endpoint type' set to 'bulk'. It then sends an OUT token packet to identify the full speed transaction type, device and endpoint address, followed by the data packet for onward transmission to the target endpoint. If the Transaction Translator receives these packets correctly and has an available buffer, it will respond with an ACK packet, otherwise it will respond with a NAK packet. At this point the Transaction Translator proceeds to send this transaction to the specified full speed endpoint, and to get a response, which it stores, ready to pass back to the host during a Complete Split transaction. When the host controller decides it is appropriate, it checks for the result by issuing a Complete Split transaction. The Complete Split packet and the OUT token packet are the same as for the Start Split transaction, except for the Start/Complete bit of the packet. This allows the hub to verify which transaction it is to present the results of. If the full speed transaction is not yet completed, the hub will respond with a NYET packet and the host will attempt the Compete Split transaction sometime later. If it is complete, then a packet containing the actual result (ACK, NAK or STALL) is sent to the host. A split bulk IN transaction is similar to a split bulk OUT, except that the DATA0/1 packet occurs during the Complete Split stage because it is now part of the response. If data was returned then the data packet appears in lieu of a handshake packet. The actual ACK of the full speed transaction was sent by the Transaction Translator to the device on receiving the DATA0 or DATA1 packet from the device, and the host will keep track of which data it has received. If it fails to receive a valid packet it will retry the Complete Split Transaction. Split Interrupt and Isochronous transactions need special treatment because of the bandwidth guarantee which they offer. Every full / low speed device using these endpoint types, which is added to the bus, is given a guaranteed allocation on the full / low speed bus, which also has to be conveyed on the high speed bus. 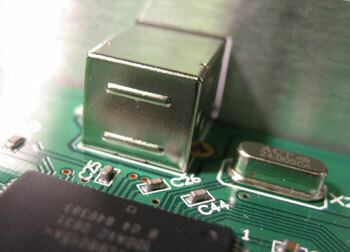 The mechanism is complex and described in full in chapter 11 of the USB specification. The result of this mechanism is that periodic transactions on the full or low speed bus are transferred in packets of data of at most 188 bytes. So a longer transaction, which can be up to 1023 bytes long for an isochronous endpoint, will be transferred in multiple Start Split transactions for OUT transfers, or multiple Complete Split transactions for IN transfers. Furthermore, on periodic IN transactions, data received by the hub from the device within a given microframe is sent in response to a Complete Split, even though it represents only part of the full or low speed data packet. A full speed interrupt IN packet of, say, 64 bytes, which spans two microframes, will be conveyed in up to two Complete Splits. The data packet in the first part will use an MDATA PID to indicate that it is not complete. Isochronous IN transactions are similar, but can span up to 6 microframes. For an interrupt OUT transaction the maximum data size is 64 bytes, so these are always transferred within a single Start Split transaction. There is no need for a handshake packet from the hub, as the interrupt will not be retried in the same frame, if missed. As with a Bulk transaction, the Complete Split will elicit a handshake packet from the device if it responded with one itself, or with ERR if there was an error on the full or low speed bus, or NYET if the Transaction Translator has not completed its task. For a split interrupt IN, we issue a Start Split (without expecting a handshake from the hub). The Complete Split may result in the complete data packet (DATA0 / DATA1) being returned, but it is also possible that during the microframe, only part of the data was so far collected, in which case an MDATA PID is used to indicate that a further Complete Split will be necessary in the next microframe. Handshake packets NAK or STALL will indicate that the device responded with this packet. ERR indicates that there was an error on the full or low speed bus. NYET indicates that the Transaction Translator has not completed its task. On the face of it, this is the simplest split transaction. There is no handshake from the hub, and no Complete Split, as the delivery of isochronous transactions is not checked. It is complicated by the fact that single full speed isochronous transactions are divided up into separate Start Split transactions of at most 188 bytes each, sent one per microframe. The Start Split packet has its Start and End bits set to identify which part of the payload is being transferred. For a split isochronous IN, we issue a Start Split (without expecting a handshake from the hub). The Complete Split may result in the complete data packet (DATA0) being returned, but it is also possible that during the microframe, only part of the data was so far collected, in which case an MDATA PID is used to indicate that a further Complete Split will be necessary in the next microframe. ERR indicates that there was an error on the full or low speed bus. NYET indicates that the Transaction Translator has not completed its task. We have examined how each type of data transfer works at high speed.